Dr. Screnock attended the University of Wisconsin (Madison) receiving the Senior Award in Chemistry upon graduation (Phi Beta Kappa) with a Bachelor of Science degree. During his undergraduate years he did research for Professor David Lamont in the department of organic chemistry. He remained in Madison to complete Medical School under the tutelage of Dr. William S. Middleton receiving the degree of Doctor of Medicine from that institution. He did post graduate training at Regions Hospital in St. Paul, MN in the departments of Internal Medicine, Surgery, Obstetrics & Gynecology, Orthopedics, Pediatrics & Emergency medicine. Dr. Screnock attended the University of Wisconsin (Madison) receiving the Senior Award in Chemistry upon graduation (Phi Beta Kappa) with a Bachelor of Science degree. During his undergraduate years he did research for Professor Paul Lamont in the department of organic chemistry. He remained in Madison to complete Medical School under the tutelage of Dr. William S. Middleton receiving the degree of Doctor of Medicine from that institution. He did post graduate training at Regions Hospital in St. Paul, MN in the departments of Internal Medicine, Surgery, Obstetrics & Gynecology, Orthopedics, Pediatrics & Emergency medicine. For many years after his formal instruction he provided medical care at the Red Cedar Clinic in Menomonie, WI. Besides his clinical duties there he was a research associate involved in clinical studies, served as the team physician for the Menomonie, Indians, assisted in caring for the football, basketball & hockey teams at Stout University and acted as the Medical Director for the American Lutheran Home as well as Chief of Medicine at the Myrtle Worth Medical Center. He has published articles in the Wisconsin Medical Journal, the Journal of Postgraduate Medicine, and the Annals of Internal Medicine. He is a life member of the University of Wisconsin Medical Alumni Association, a life member of the Academy of General Practice and a Fellow of the American College of Medicine, from which he received the Certificate of Advanced Medical Studies. He is a five time recipient of the Physicians Recognition Award by the American Medical Association. 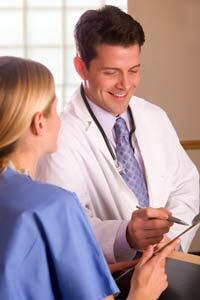 In 2004 he was named one of America's top Family Physicians by the Consumers' Research Counsel of America. He has attained the level of Board Eligible conferred by the Academy of General Practice. He served as Chief of Staff of Luther/Middelfort Oakridge Hospital from 1995 through 2007. His medical interests include preventative medicine, complexion improvement (acne & Botox treatments) geriatrics and chronic disease care (arthritis, hypertension, heart disease & diabetes). He is married to the lovely Lynda Lee Screnock. He has three children. The couple resides in Osseo, WI.